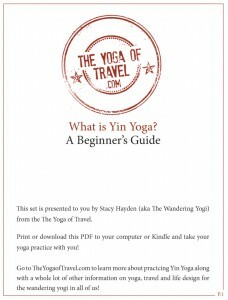 Print or download these PDF yoga sets and meditations to your computer or Kindle and take your yoga practice with you! 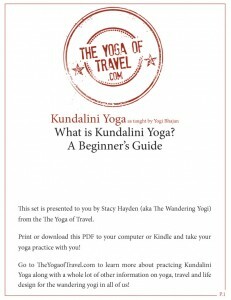 All the basics for getting the most out of your practice in class as well as what you need to know to have a successful personal practice at home and on the go! the top. The movements also increase circulation of the spinal fluid which is linked to mental clarity. 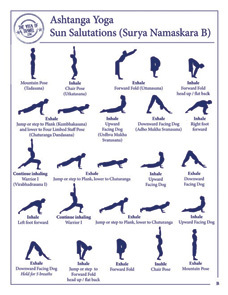 The Wandering Yogi recommends you practice this set before and after long periods of travel in planes, trains and automobiles. 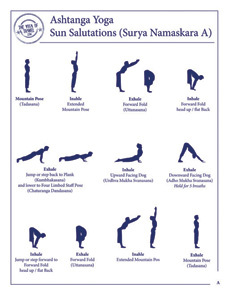 Below you will find 7 timers for 5, 10, 20, 30, 40, 50, and 60 minute silent meditations. There is a single bell that chimes about 8 seconds after starting play, then the specified period of silence and then a single bell that chimes at the end. Since you can download these to your computer, phone, mp3 player etc, they are perfect for use at home and the office as well as on your travels! 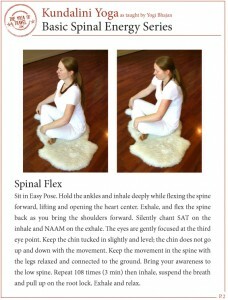 They are also perfect for yoga and meditation teachers to use while teaching and holding space for practice.